Batman Eternal #4 proves to be the first misstep in this series' run. That misstep is not due to the art team., despite Dustin Nguyen and Derek Fridoles having a far different style from Jason Fabok who drew and inked the first three issues. Nguyen's light, almost Mangaesque pencils offer a unique, angular look and Fridole's inks - with some exceptions - are kept light and restrained, allowing the original pencils to shine through. No, the biggest problem with this issue is the script. Specifically, the dialogue. John Layman's take on Batgirl and Batman don't ring true to me. Even with her father in danger, I can't see Barbara Gordon acting as rashly as depicted here. 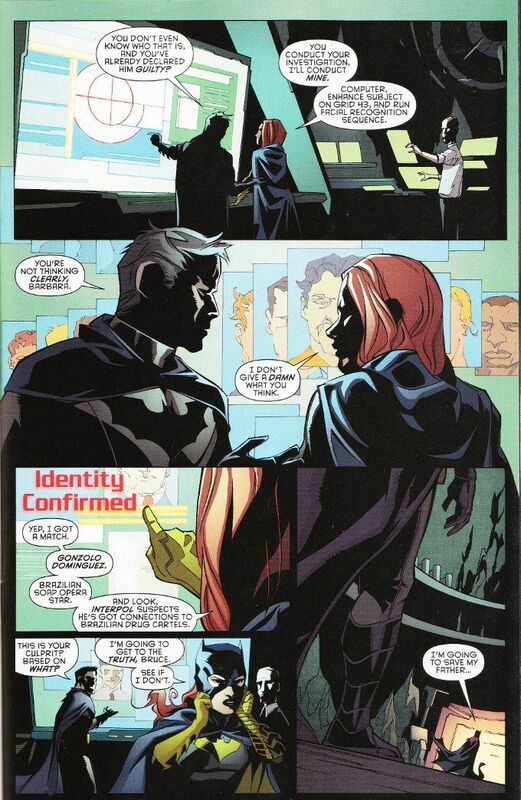 Nor can I see Bruce Wayne being so quick to dismiss Barbara's desire to investigate a suspicious figure she spots on the security camera footage of the crime scene, because they have no reason to suspect said figure save that he spent three hours hanging around the crime scene before anything happened! Particularly when Bruce freely admits to having no better leads himself. Despite this forced dialogue, the story is still a strong one. The plot involving the corruption of the GCPD continues apace. There's also an interesting twist in the subplot involving Stephanie Brown that marks a major departure from the original comics in which she appeared. This comic is still an enjoyable read, if you just get past some of the words that the characters are saying.